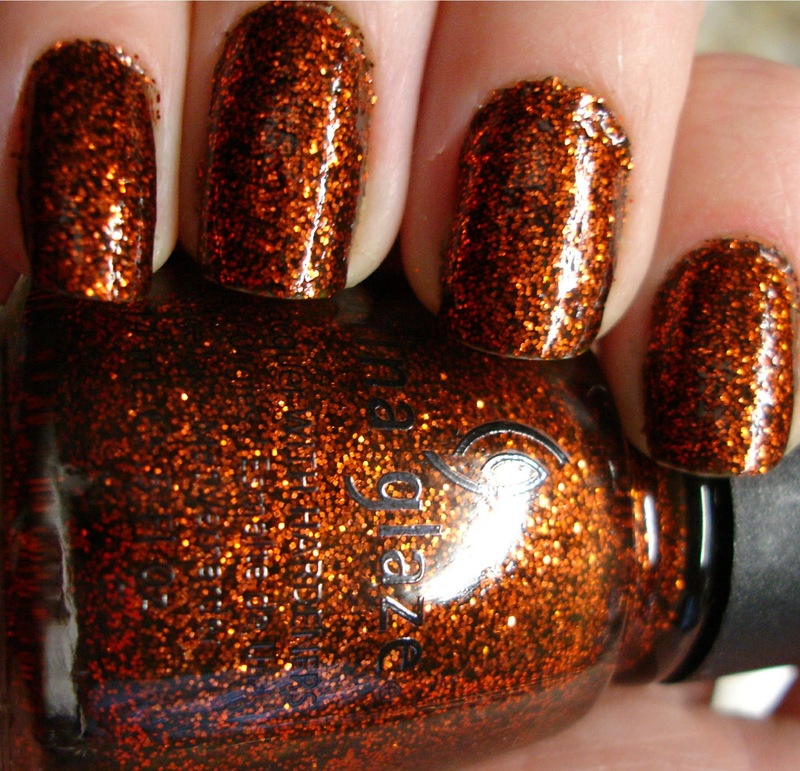 This is three coats of ChiChi Sally Spectra, a really pretty bright orange that was sent to me by Nicole from MAGIC MAID - thank you so much, Nicole! The polish applied really well, although it was a tad thin. This probably could have used four coats to eliminate all VNL, but three was enough since I was planning on adding the tips anyway! Very smooth application with great dry time. Hope you all have a great Halloween!! 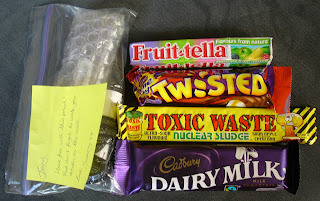 Sammy sent me some yummy goodies from the UK, I am really excited to try them out! In that bag is the scroll to log the travels of the polish, as well as the beautiful polish itself! 2. 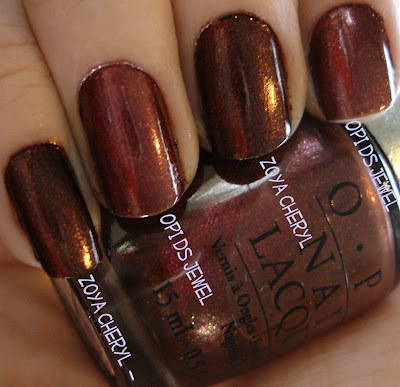 You MUST offer your readers the same opportunity - don't stop passing this polish around the world! If you are interested, please comment, leaving me your name, your blog and your general location. 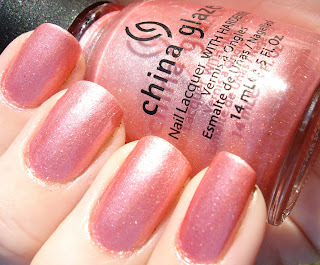 I will pick a random winner when I post my manicure, and send this baby on its way! 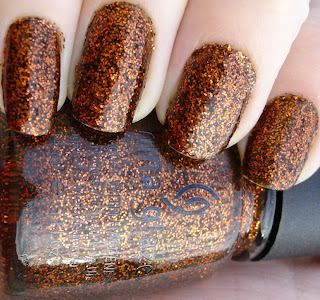 This is a polish I am sure you have all seen plenty of by now, but I HAVE to show it to you again because it is absolutely amazing! 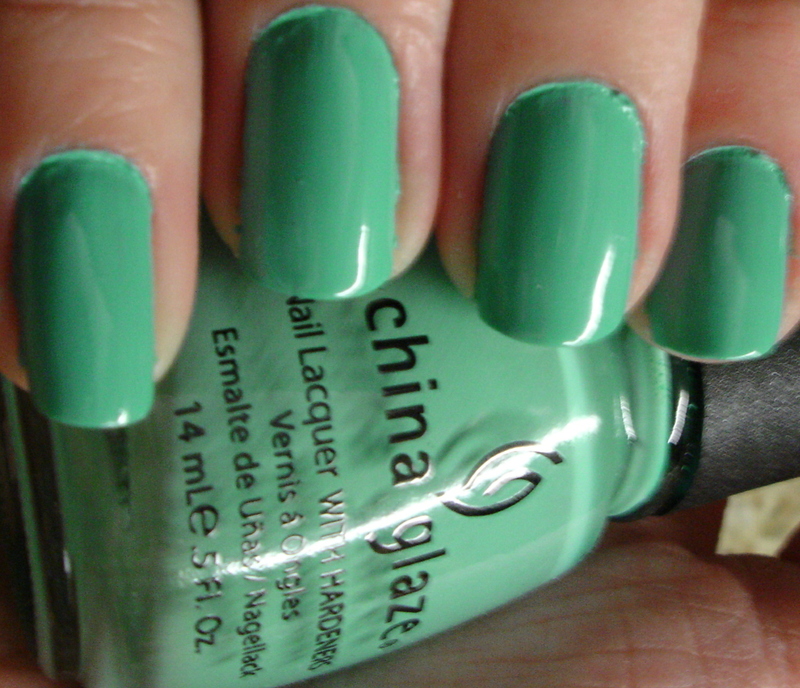 China Glaze Ick-A-Body is a murky green base completely packed with orange glitter! This happens to be three coats, even though two was totally sufficient on all of my nails but one, which was my fault. So I just added a third coat to each! Application was otherwise fabulous with a really decent dry time. The surface was bumpy, as with most glitters, but a coat (or two) of Seche Vite or another top coat will smooth this down acceptably. Removal was obviously a pain, so I seriously suggest the foil method! In my opinion, this is the perfect Halloween polish. I love it to pieces. I seriously could not stop staring at my nails - at work, in church, out to lunch... it was that shiny. It is a perfect pumpkiny color, and even though it is pretty much impossible to tell that the base is green it shows up every once in awhile, and I kind of like that it is something different. I suggest you go and grab it before it is gone. Mine will be getting heavy use every October from now on. I think it also makes a very nice fall polish, doesn't necessarily have to be Halloween! 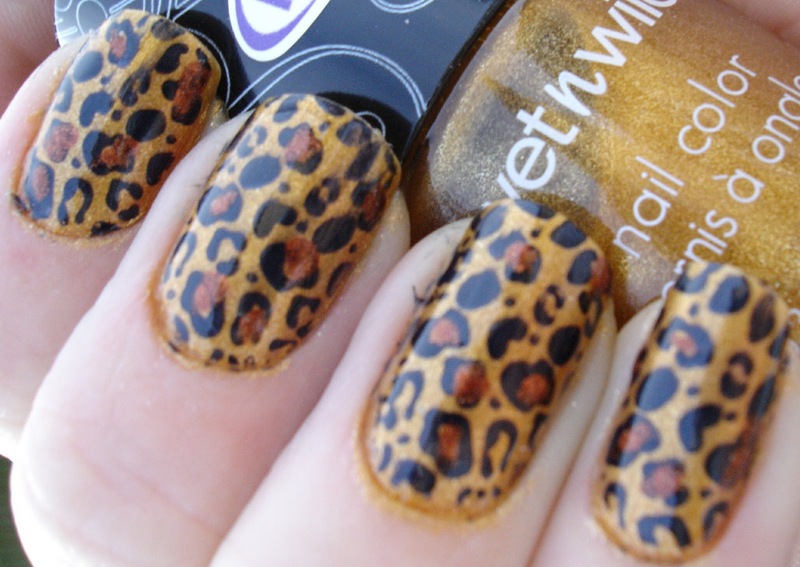 What do you think of this polish? What is your favorite Halloween polish? Now an amusing story (to me, at least). I went out to the front yard to take pictures of my nails yesterday, and guess who I found sitting on my driveway? Becky came over a few nights ago and wanted me to do her nails. 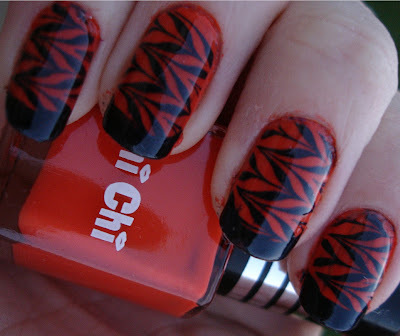 She liked the MULTI-COLORED KONAD that I did before quite a lot, so we decided to do a similar design on her nails! 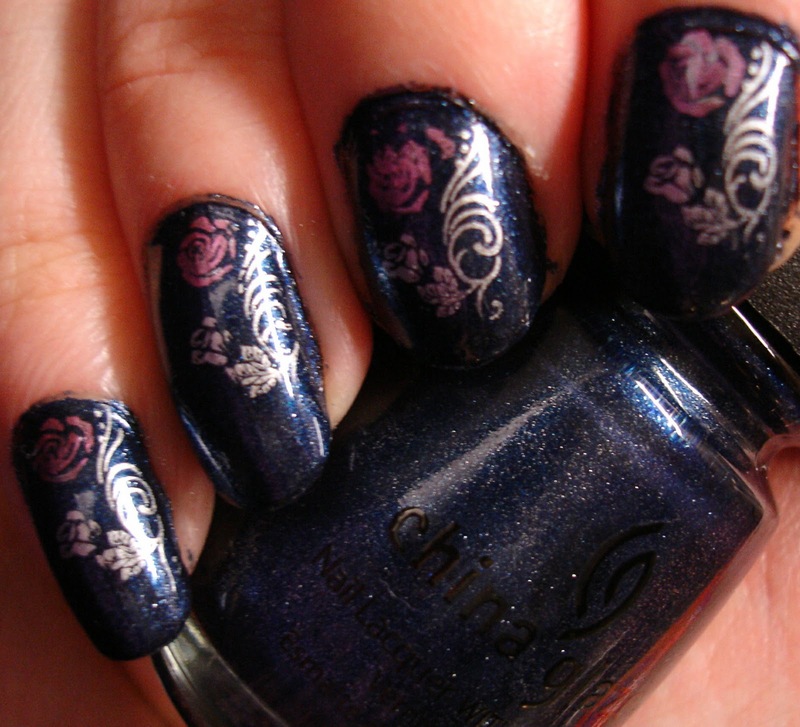 After applying Midnight Mission, I used Konad plate m54 to create the multi-colored rose design on the nail. 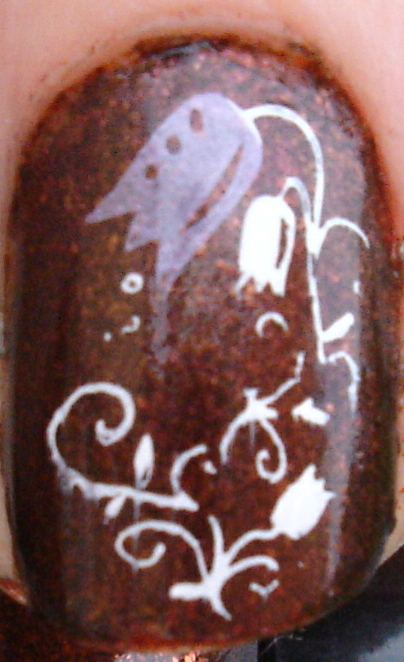 For the majority of the design, I used Nicole by OPI Positive Energy, which is a fabulous silver for stamping. 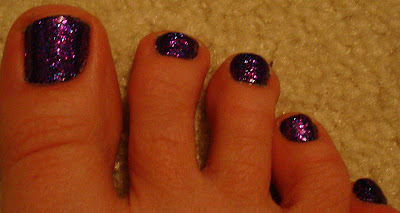 For the rosebud, I used Sally Hansen Lilac Chrome, which is a very old metallic pink that I have had for many, many years. I had read elsewhere that the SH Chromes work well for stamping and I am pleased to report that they do indeed! 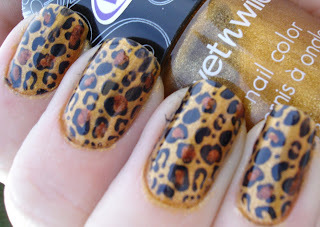 I topped it all off with a coat of Seche Vite and was finished! I was really pleased with this manicure. For the most part, I was able to get the design to transfer much more smoothly than the previous multi-color (although you can see I had a bit of problem on the middle finger with the pink rose). The blue is such a pretty color, I only wish I could give you some daylight pictures to show how gorgeous it was! But seeing as how it was 10 pm when we did this, no daylight. The late time is also why the final product is a bit on the messy side, since Becky had to get home there was not much time for cleanup. Anyway, Becky loved it and I did too, so overall I declare this a konadicure success! On an unrelated note, I have to share this photo with you. I walked downstairs yesterday while holding my phone, and found my babies curled up on the futon having just woken up from a nap. They looked so perfect I had to snap several pictures. Apparently Leo does not see the phone as a camera (yet) so he is not quite as freaked out by it - good to know for the future! Here is one of the many amazing photos I snapped. Leo (r) and Luna (l)! 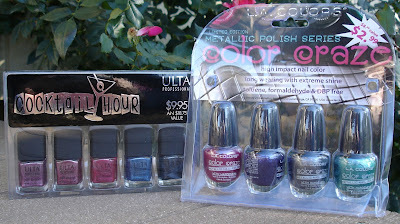 Speaking of which... make sure you ENTER MY GIVEAWAY if you haven't yet! Last week I received my package from Magic Maid's blog sale. Included in the package was a Konad plate I have been wanting for quite awhile, m57. I just had to take a break from Halloween nails and use it! 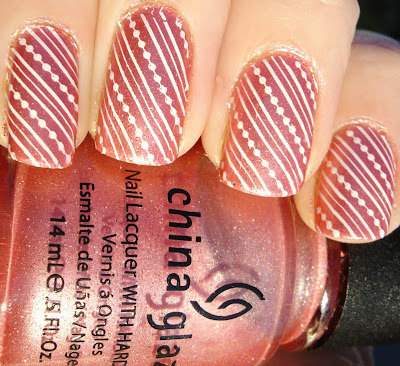 I have had the idea for this mani for quite awhile now. 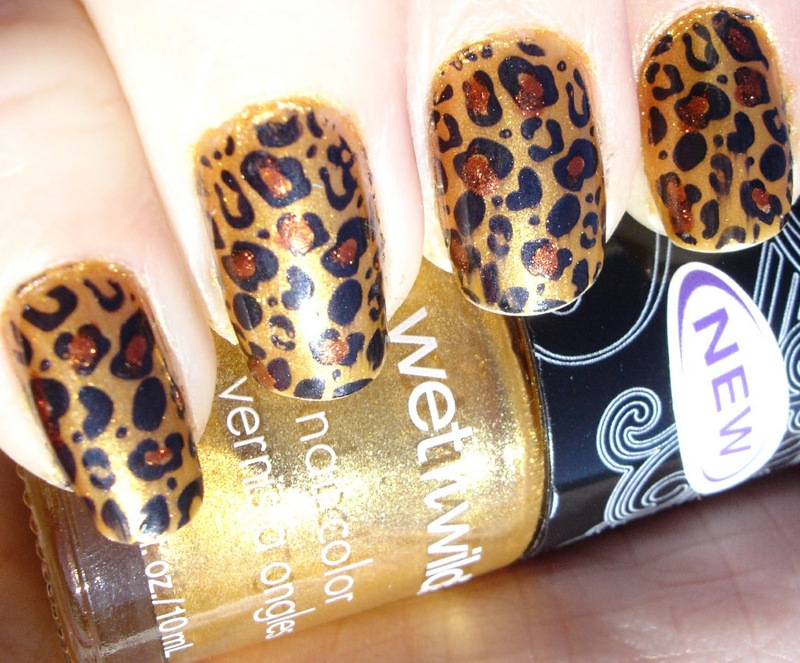 I actually picked up the two polishes I used with the specific intent of doing this exact manicure! 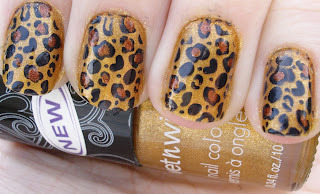 For the base, I used Wet n Wild Craze Goldmine, a gorgeous golden shimmery polish. It was very sheer, taking four thin coats to reach full opacity, but the dry time was great and the final effect was gorgeous! Three coats left just a touch of VNL, which is why I sprang for the fourth coat. Shade, left hand - the nubbins are finally starting to get there! On top of the golden color, I used Konad plate m57 with Konad Special Black to add leopard print spots to the nails. Then I used Wet n Wild Craze Rustic to dab a bit of a darker brown, shimmery color into the middle of some of the open spots. I topped it all off with a coat of Seche Vite and was good to go! Sorry for the slightly messy cuticles here, I had no time before the sun went down so I did a super speedy clean-up just to get a couple of larger messes, and didn't really get a chance to clean up the rest of the cuticles. 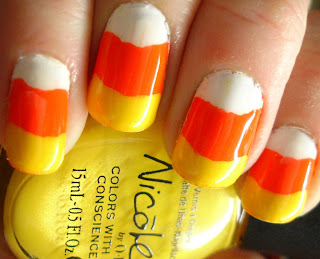 Overall this mani was really fun, wore well and I loved the colors. I am so glad I finally got a chance to do this mani. I had some awesome inspiration! On Leo, of course! Not only is he like the sweetest kitty cat ever (even if he is super shy around strangers, unlike Luna who thinks that she is a dog, or perhaps "a people" as Dan and I say), he is also in my opinion the most gorgeous cat I have ever seen! So it is no wonder that he would be inspiration for art - nail art or otherwise! I wanted to get a picture of my nails on Leo, but he is not such a fan of cameras. Even when they are not on, he does not seem to like it so much. 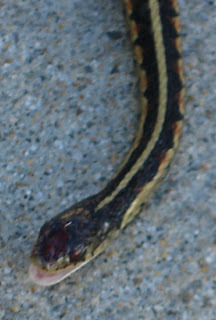 I think the photo shoot I put him through last spring traumatized him. So that is the only picture I was able to get. 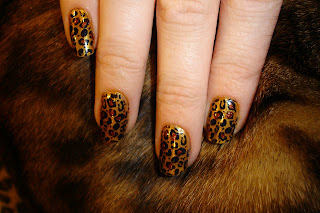 I think the nails were a pretty decent representation of Leo's coat. 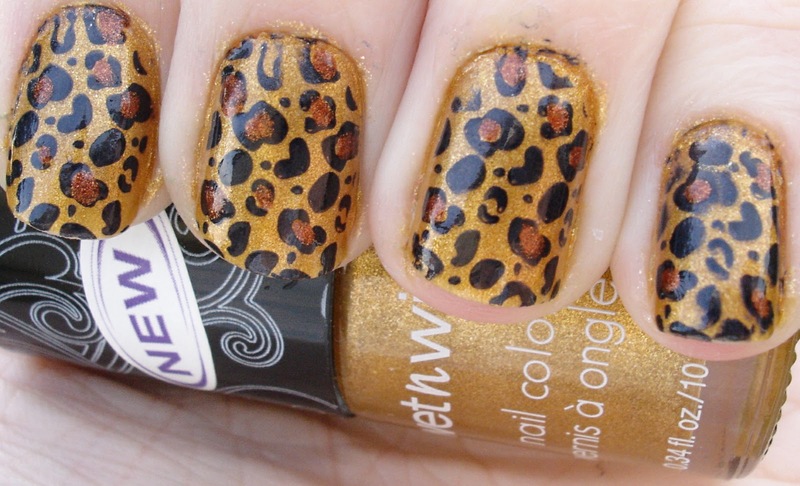 What do you think of my Leo print mani? Have you ever done nails inspired by your pets? 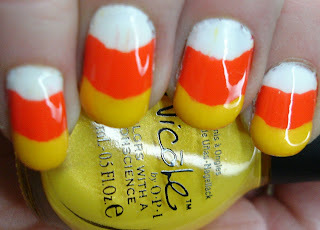 Today I have for you my version of candy corn nails - a classic Halloween candy made into a fun french-inspired mani! This is an idea I have had since I first really started my polish obsession a few months ago, although I have to say I was a little afraid to try it since I have historically been somewhat bad at free-painting tips. I think it turned out fairly well though! 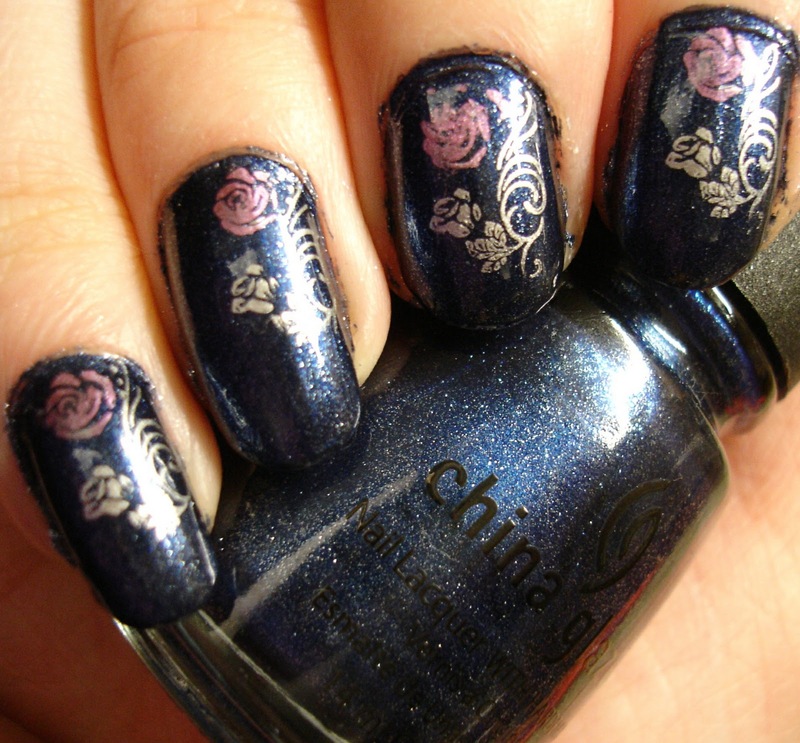 This is actually my second attempt at this mani.. more to come on that story a bit later though, haha. For these nails, I used NailTek as a base coat and then added two coats of Sally Hansen Xtreme Wear White On for the white. I then added a coat of Seche Vite over the white (something I decided to try after the first attempt; more to come) and over that used two coats of OPI Brights Power, the orange (and it is indeed very bright). After another coat of Seche, I finished off with two coats of Nicole by OPI One Voice for the yellow tips, and topped it all off with a final coat of Seche! 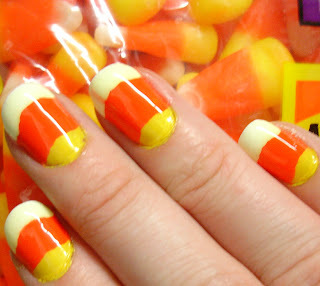 I think these nails are fun and festive, and I got a lot of great compliments on them! Outdoors, partial shade - look at that shine! You can see that there was some tip wear, almost like the polish shrank up a bit. I wonder if some of that is because by this point I had something like thirteen (!!) coats of polish on my tips... yikes! But it was a really fun mani and I enjoyed it a lot. As for the first attempt, which you can see above... I added colors in the opposite direction, starting with yellow and ending with white - since white tips are classic I thought I would try that first. This caused some problems for me, since the yellow took three coats to be opaque, and the white was a bit thick. By the end I had a totally gross thick goopy mess on my tips. Also, the white tips yellowed quite a bit and there was more significant color streaking (neither of which is quite as obvious in this particular photo), which is why I decided to add the top coat in between colors. I was debating whether to leave it a bit or try it again when I got a HUGE smudge in what I thought were fairly dry nails, and then wet polish started oozing out.. yuck. So I took it off and switched the order and it looked great! 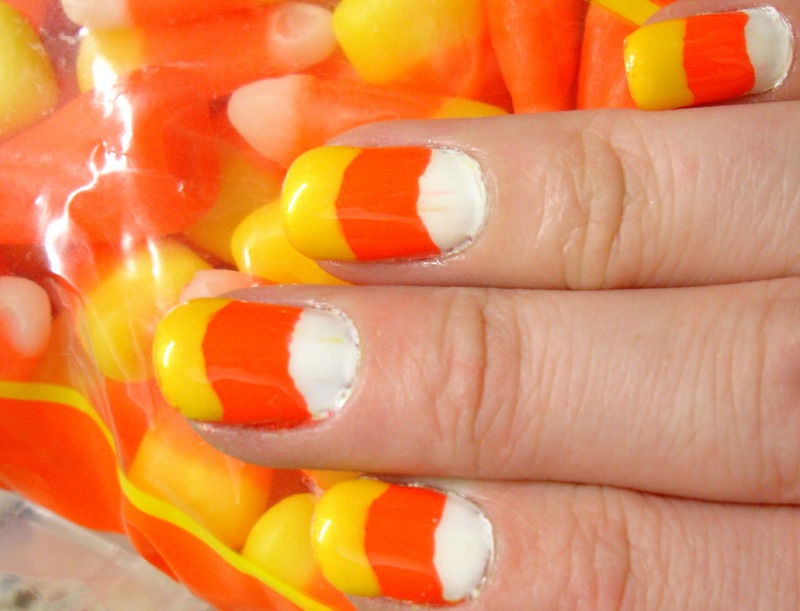 Much less gloopy build-up and actually, with my nail shape, I think looked a bit more like real candy corn with yellow at the tips. To see another great candy corn mani, and to see a tutorial, you can head on over to BABBLING BROOKE. Also just a reminder to ENTER MY GIVEAWAY if you have not yet! 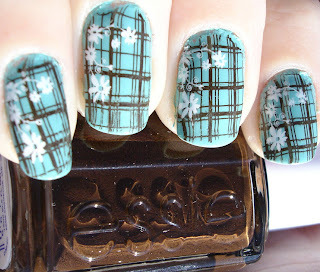 Today I want to share with you some nails that I think may be up there among my favorites ever - beautiful base color, fun patterns, and a preppy fall look! 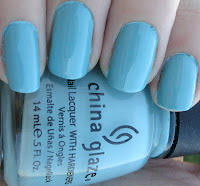 For these nails, I started out with two coats of China Glaze For Audrey. 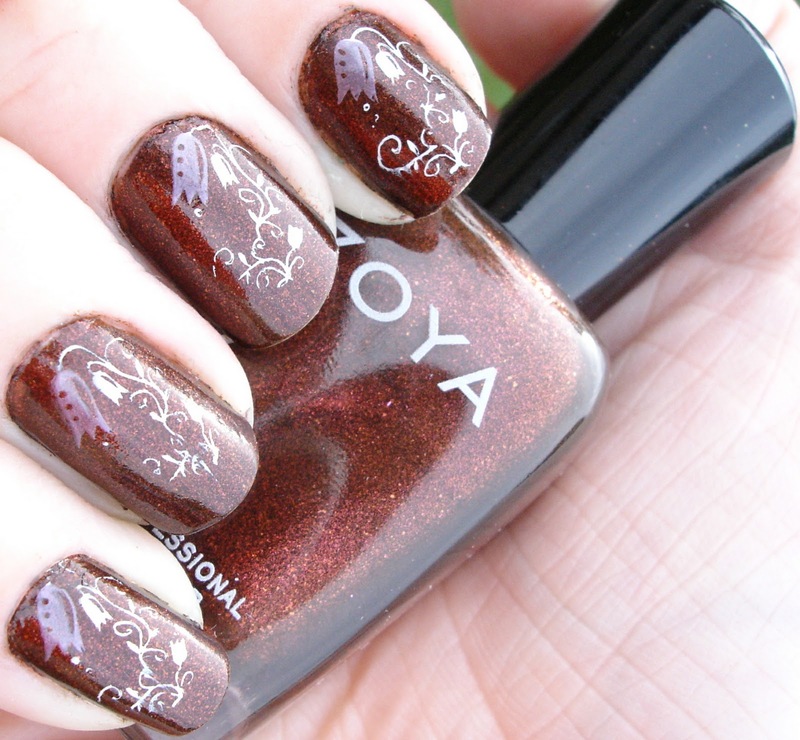 I had used this polish as a stamper before but not on the whole nail, and let me just say - WOW! This is such a gorgeous color, no wonder it has gotten so much attention! It was silky smooth application, dried well and looked amazing. 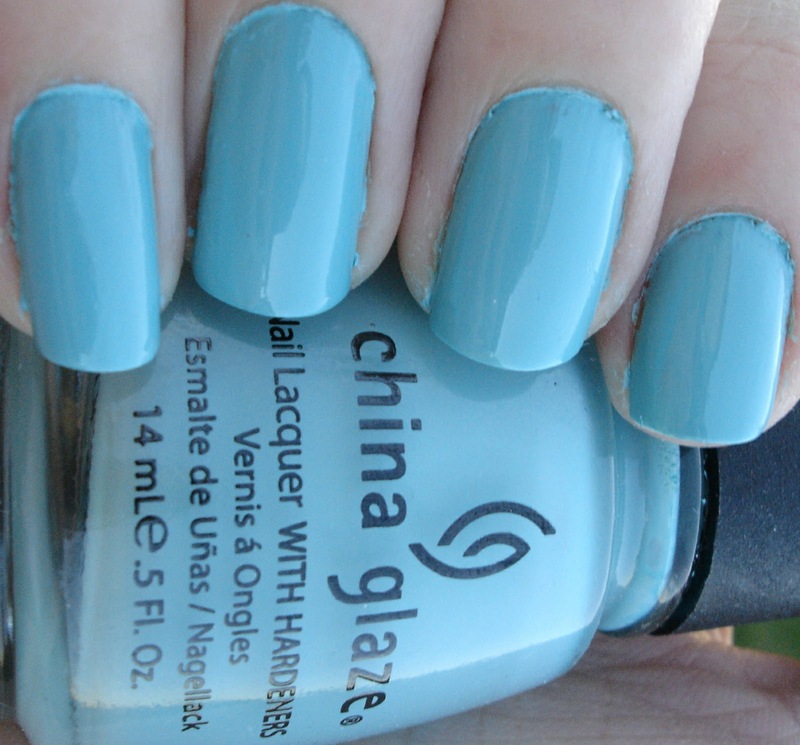 It is a tiffany blue color, or a slightly green leaning light blue. I have a couple of pictures below showing how different this polish may look in different lighting. 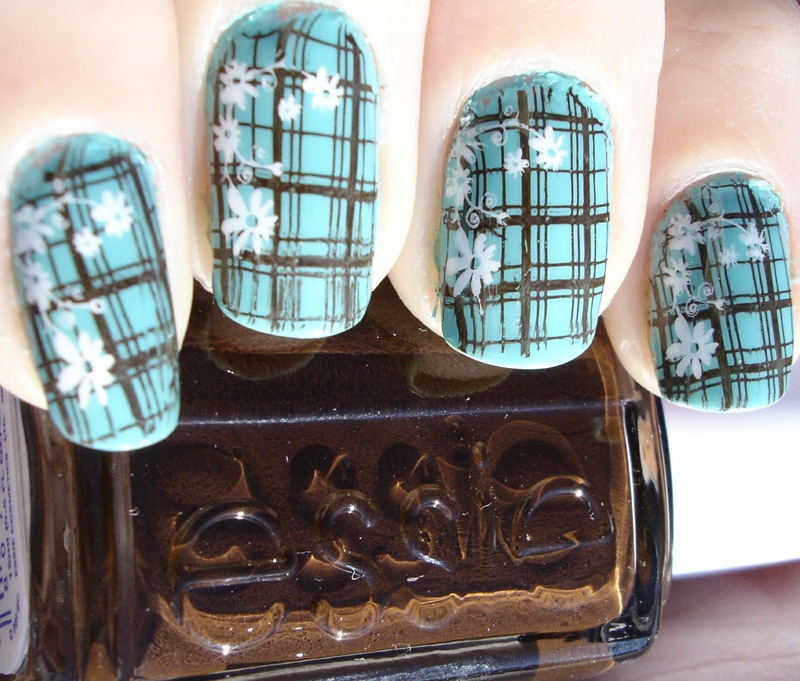 I used Essie Little Brown Dress to stamp the brown plaid using Konad plate m60. Mostly this worked out well, although you can see that the pinkie finger stamping was just a tad crooked. 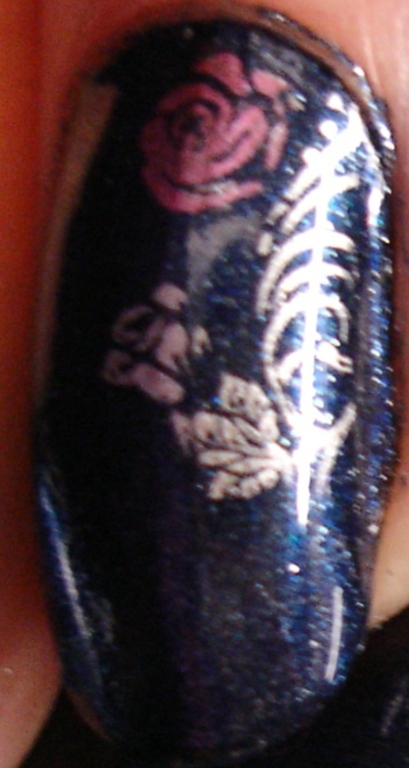 Then I added the flowers using Konad Special White polish and plate m35. I topped it all off with Seche and wore it all weekend! Above you can see For Audrey by itself, looking very blue in low natural light and very green in artificial indoor light. However, I would say the color you see on the two final design pictures are most representative. 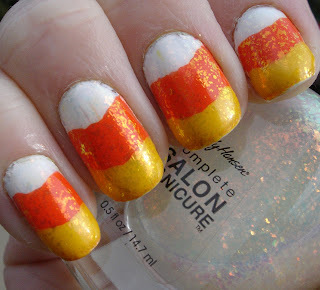 I loved this mani, thought it was a perfect fall look. Hope you like it! 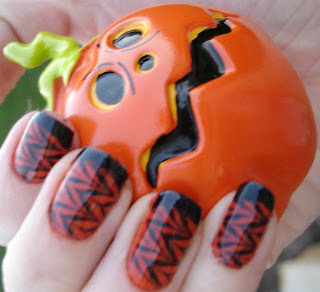 I will have some fun Halloween nails coming up soon, like the design I am wearing now... look for it within the next couple of days! I have had these sitting around for awhile, and I was originally planning on waiting until 150 followers to start up this giveaway. But... I figure I am close enough. :) I couldn't wait any longer to do this to thank all of you who visit and comment, I am coming to really enjoy this community! One lucky winner will receive these two sets. 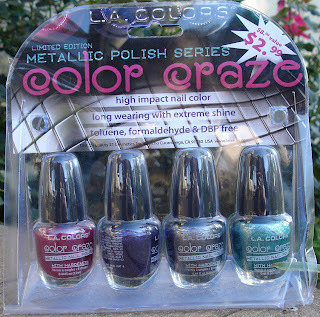 Included is LA Colors Color Craze Metallics LE Series, which I have swatched and reviewed HERE. This set includes four shiny metallic polishes in magenta, deep purple, green and steel gray. 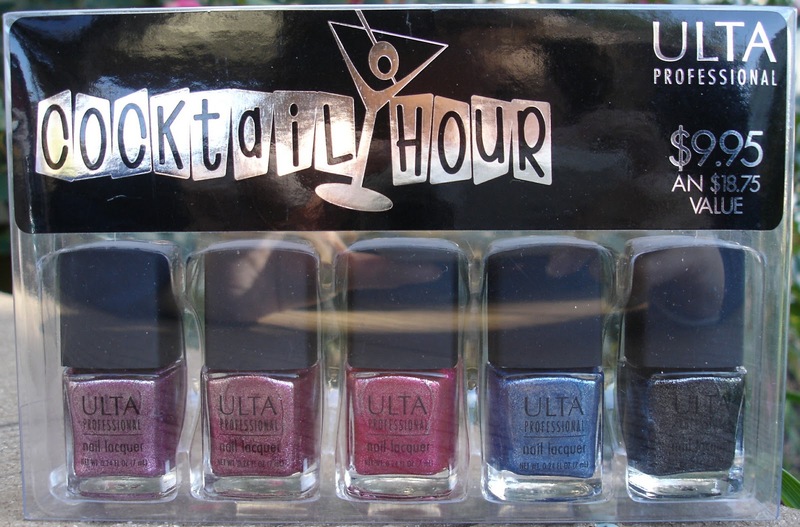 Also included is the ULTAProfessionals Cocktail Hour Minis set, which includes five fabulously shimmery polishes, perfect for fall and for the holidays! These include Raspberry Mojito, Cranberry Mojito, Sangria, Blue Kamikaze, and Black Russian. This giveaway will run until 11:59 pm, Central Time, on Friday November 5th. I am giving you all a LOT of extra entry options in this one! Please try to submit all of your entries in one post, it is really helpful! Here is the entry form! 1) You MUST be a follower to enter; old and new, international included! Please tell me the name under which you are following and include an e-mail address I can contact you at! This is worth 1 entry. 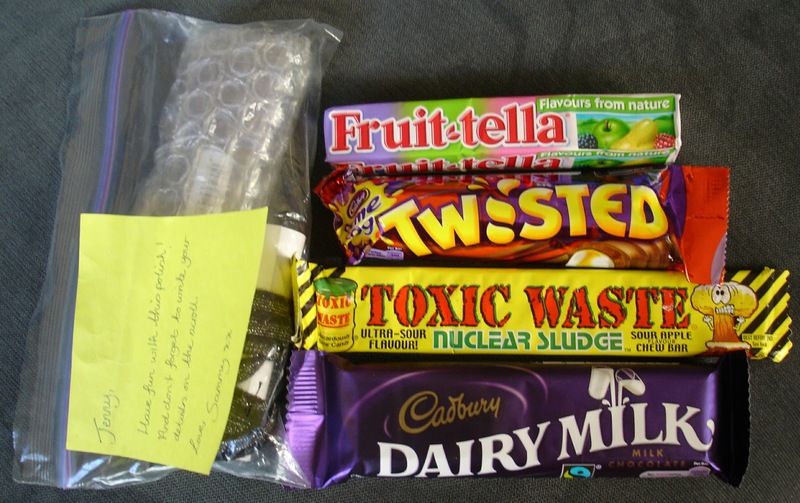 2) Blog about this giveaway, either in a post, on your sidebar or on a separate giveaway section (1 entry). If you include a picture, this is worth an additional entry (2 entries total). Please leave the link where you blogged, and mention if you used a picture. 4) Follow Polishology on Twitter! You can find my profile HERE. Please tell me the name you are following under (1 entry). 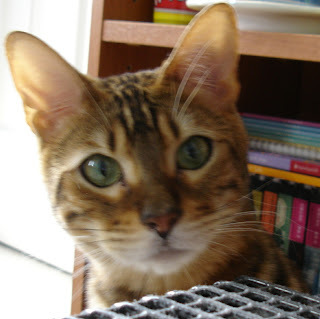 6) Please tell me what you would like to see me do with this blog in the future. This may include things like more or less: nail art, swatches, comparisons, personal narrative, posting frequency, brands of polish/types of polish covered, tutorials, pictures of my kitties (haha, of course everyone wants more of those!) etc. Basically, tell me where you would like to see this blog go in the future. What will make you enjoy it more? I want to make sure it is both fun for me as well as my readers, so I would love your feedback! This is worth 3 entries. 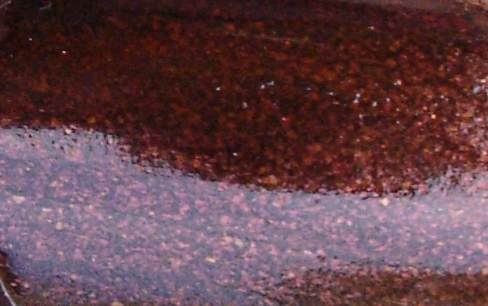 I really want to encourage this one, because I want your help making Polishology great! That is a grand total of 9 possible entries. Please make sure to leave your e-mail address for me, or I will not be able to contact you if you win! The winner will be chosen shortly after the November 5th deadline by Random.org, in the same manner as the last giveaway. The winner will be notified by e-mail and given 72 hours to respond; if I do not hear back from them a new winner will be chosen. 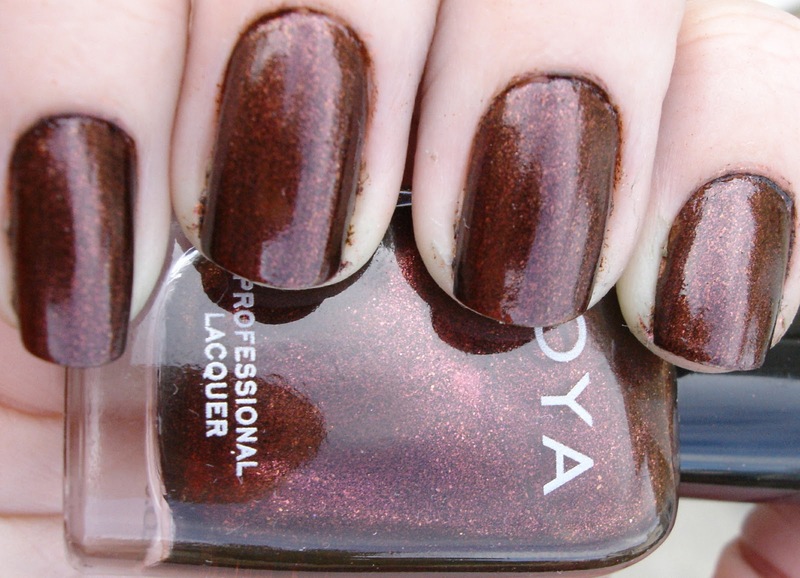 When I first received my Zoya Cheryl in the mail, Becky was over here and she was wearing DS Jewel. Instantly we noticed that the two seemed very similar. I looked for a comparison between the two and didn't find one, so I decided to go ahead and do one for you all! You can see that in the bottle, the colors do seem to look quite similar. Even here you can tell that DS Jewel looks just a touch more pink, but it is really hard to tell if there is much of a noticeable difference or not. On the nail, there is definitely a huge difference. Cheryl is a much darker color, with Jewel being lighter and again, pinker. 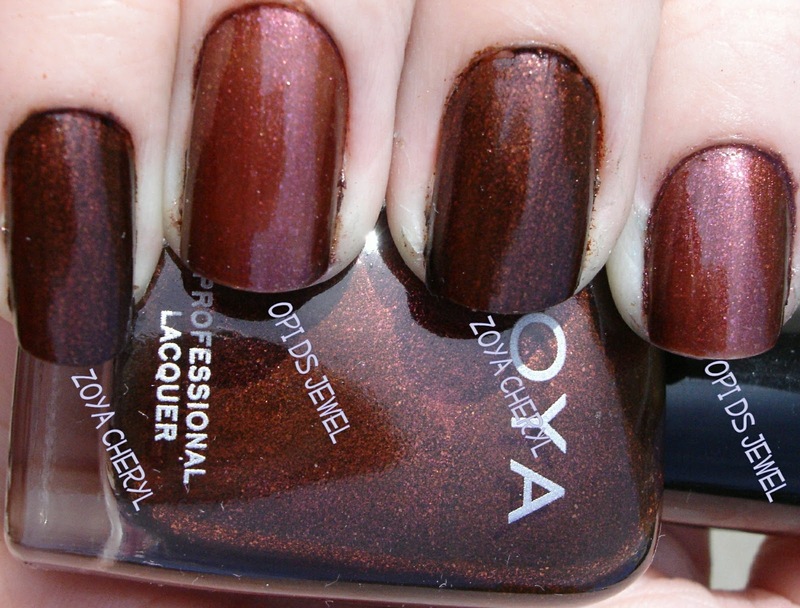 Another huge difference was opacity - Cheryl took only two coats, while Jewel took four coats to achieve full opacity. However the drying time on Jewel is decent, so the extra coats didn't bother me that much. Cheryl did have a small amount of bumpiness going on that I wasn't really expecting (which you can see a bit in the close-ups, especially around the shade-to-light zone), while DS Jewel was totally smooth. However Zoya definitely wins on application between these two with its high pigmentation and two coats. In the close-up photos above the differences are very apparent. 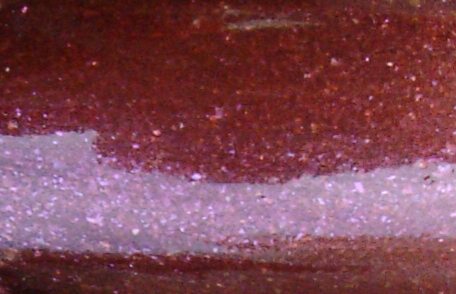 In addition to having the overall more burgundy-brown look, DS Jewel also has rosy pink microglitter, as well as some gold that is hard to capture. 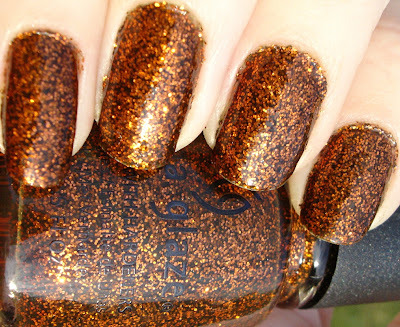 Cheryl instead has coppery, metallic glitter. So as it turns out, these are very different. 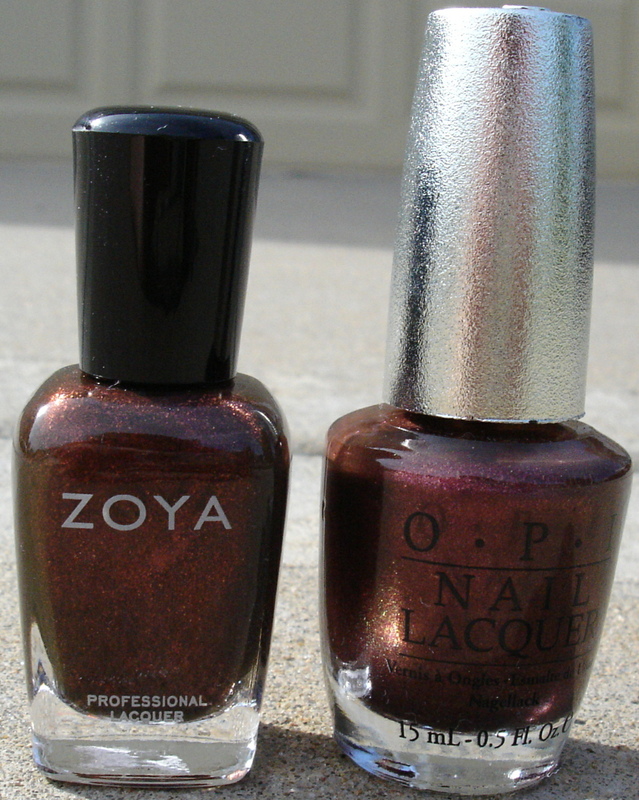 Both are fabulous fall (or winter) shades, and I really like them both a lot. Zoya Cheryl belongs to me, and OPI DS Jewel belongs to my sister Becky, so I will definitely be borrowing DS Jewel again at some point for a full mani using it. 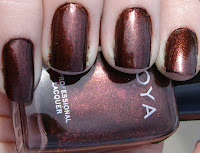 I love both the more bull brown/coppery look of Zoya and the rosy effect of the OPI DS. Which is your favorite? Several days ago I ordered Jessica Funkytown from the Paint The Town collection online. It looked really pretty on swatches and I loved the bottle. 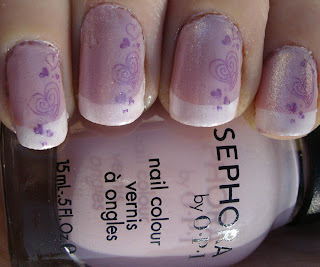 I received it yesterday, and was dying to use it - but I wasn't quite ready to take off my fairytale bubbles mani yet. So... new pedi time! I know that some of you are not the biggest fan of toesies pics, but this polish is too pretty not to share! 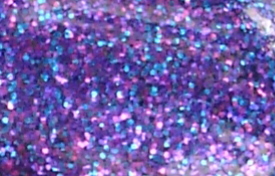 It is an absolutely gorgeous purple/pink/blue chunky glitter polish that is super sparkly; the pictures I was able to get simply did not do it justice. The downside to this polish is that it is very sheer - this is five coats of Jessica Funkytown for full coverage! In the future I may choose to use a base of a darker purple and try for less coats to see what that looks like. However it was worth it, as it is totally gorgeous. Not too bumpy either, a coat of Seche Vite smoothed this out to perfection. 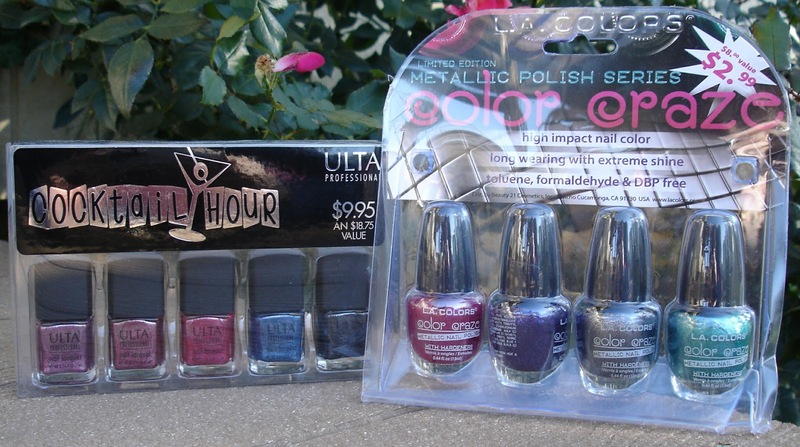 The polishes from this collection come in little paint can bottles, how cute is that? 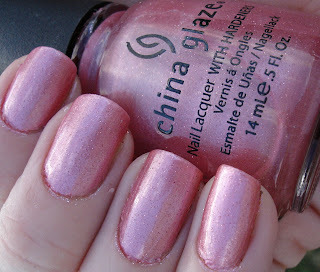 Overall very pleased with this polish, it will probably stay on my toes for quite a while! I figured this might be a good time to show a couple of kitty pictures, to make up for only having pedi pictures to share today. And because they are just so adorable! 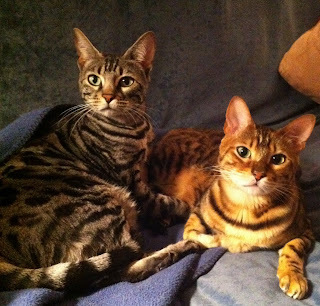 Here are my two babies! 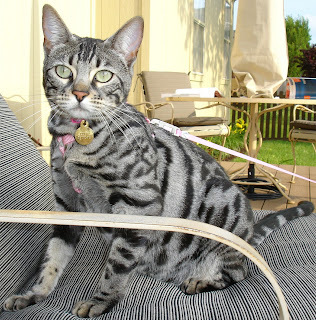 Luna loves being outside on her leash. Leo hates it, which is funny because Leo probably enjoys looking outside the most out of the two (of course they both love staring out windows). I just realized today that I hadn't shared any kitty pictures with you all other than Luna up there on the banner so I thought you should see the crazy babies! Hope you have a great weekend and I should have new nails for you very soon!